Adam Fellows, the chef at the modern European restaurant, Goodfellows in Wells, Somerset has perfected this recipe using spelt flour. Pâtisserie is one of his specialities. Put the flour in a large bowl, then rub in the cold butter, using your fingertips, until the mixture resembles fine breadcrumbs. Stir in the sugar, then the egg, then gradually add enough ice-cold water,a drop at a time, to bind everything to a smooth dough. You might need about 2 tablespoons. Cover with cling film and chill in the fridge for about 1 hour to relax the dough. Preheat the oven to 180°C/350°F/Gas 4 and grease four 10cm/4in loose-based tartlet tins. Turn the dough out onto a lightly floured work surface and roll out to about 5mm/¼in thick. Use to line the prepared tartlet tins and trim the edges. Line each pastry case with a piece of baking paper and cover with baking beans. Bake for 5 minutes, then remove the paper and baking beans and bake for a further 3-5 minutes until just golden. Remove the pastry cases in their tins from the oven and transfer toa wire rack to cool. Spread the raspberry jam on the bottom of the cooled pastry cases. To make the filling, beat together the butter and sugar in a large bowl, using an electric mixer, until pale and fluffy. Add the ground almonds and egg and mix to a smooth cream. Spoon into the pastry cases and smooth the tops. 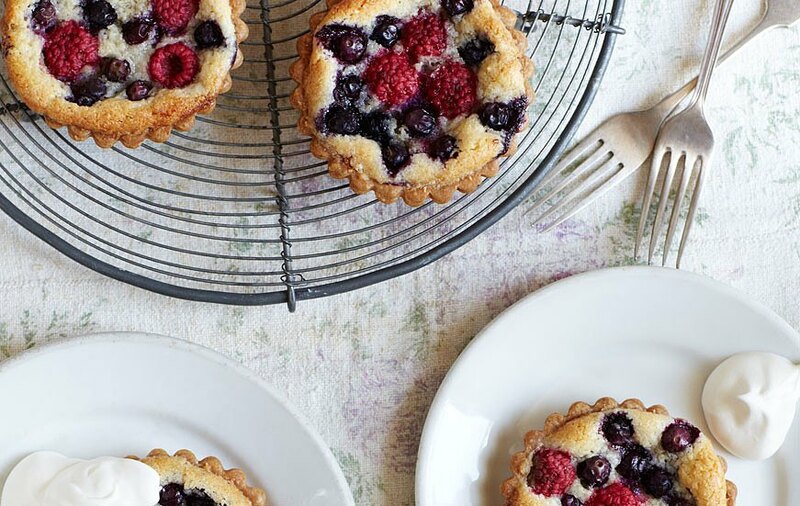 Scatter the mixed berries evenly over the top and bake for 20 minutes, or until spongy, golden and firm. Transfer to a wire rack to cool, then serve with cream or crème fraîche.